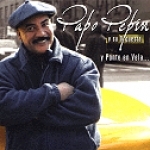 Pepin, the conguero, long an important figure in New York, pulls off a swinging salsa date that doesn’t stop. One listen to the first tune — "Buenos Dias America," by the Cuban composer Pablo Milanes — tells you this is going to be, fast hard and long. There’s even a piano solo, suggesting that the date’s made for dancers, and listeners as well. The singing, by Carlos “El Grande,” soars over the coro. There are guests: Ruben Rodriquez, Guillermo Edgehill and Carlos Velazquez on bass and Ricky Gonzalez on piano. This is New York salsa dura at its best, the sort of thing that should be recorded all the time, rock solid, full of swing. There’s no slowing down here.